I feel about Gap much the same way I feel about Banana Republic: a once great brand long past its glory days. 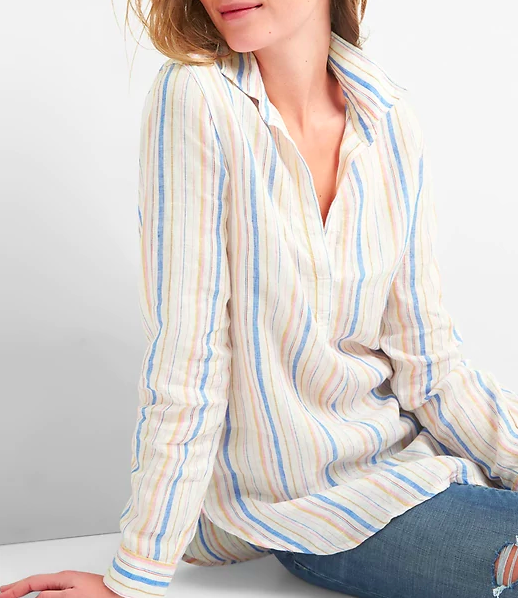 But if you do some digging, you can still find some pretty good clothes there, like this subtle striped linen popover. 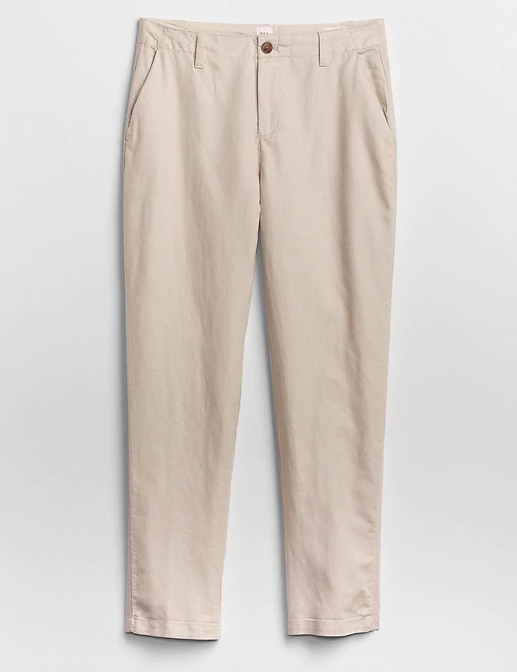 Just a good solid pair of chinos. 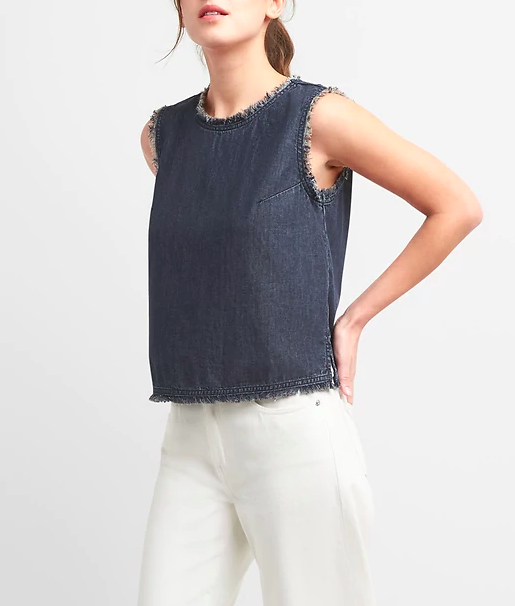 This denim top has a Japanese feel to me. 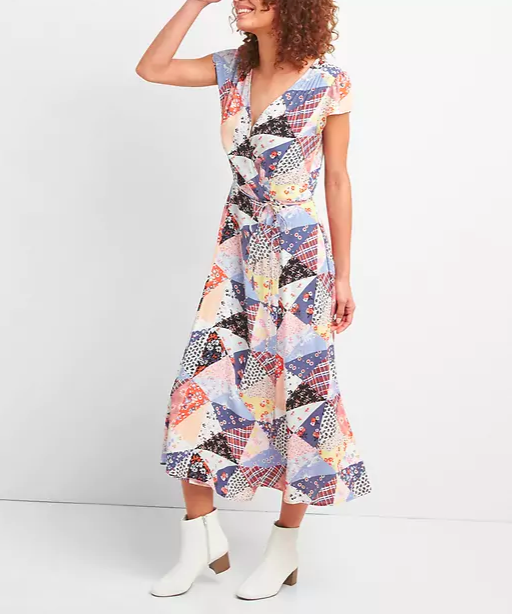 I know the quilt-y patchwork print on this dress is on the crazy side, and I’m not certain I’d have the nerve to wear it, but I think it’s pretty fantastic, and hope that one of you goes for it. 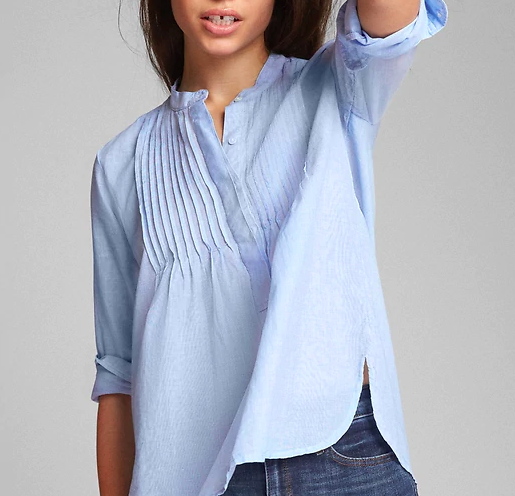 Such a good, flowy summer blouse. 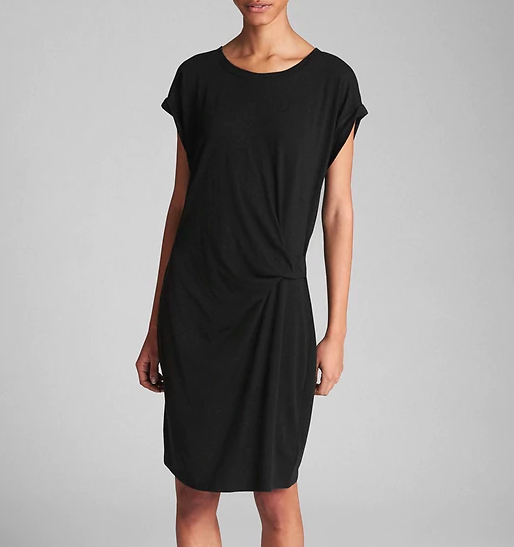 I showed you a t-shirt dress like this one yesterday, but I like this one even better because the neckline is more flattering. This top has subtle metallic stripes, which is fun. 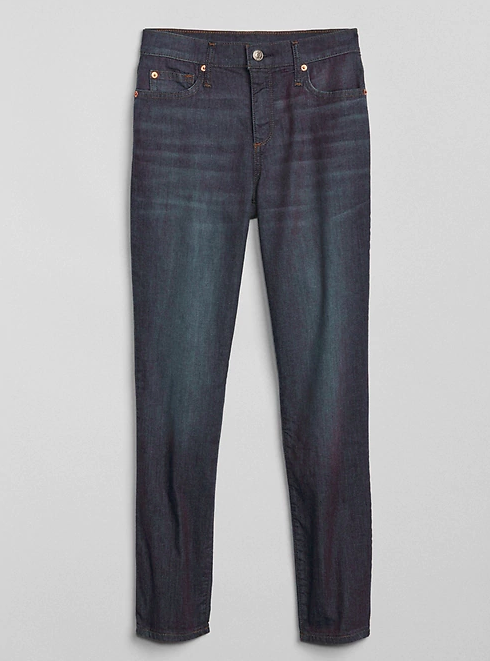 These jeans made the cut because they’re mid-rise instead of high, and because the wash is dark. Also, there’s a minimal amount of whiskering. 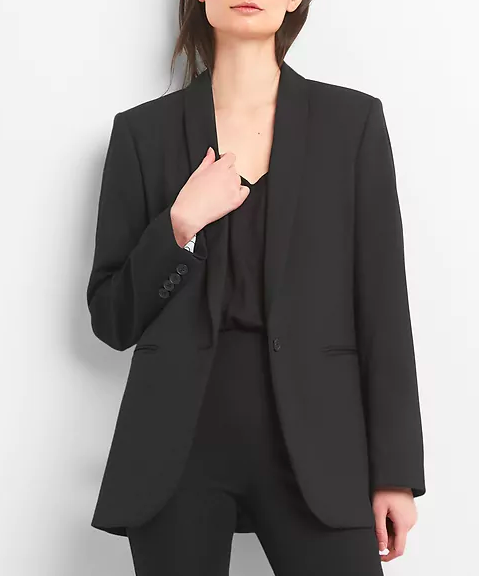 The cut of this blazer is pretty sophisticated. 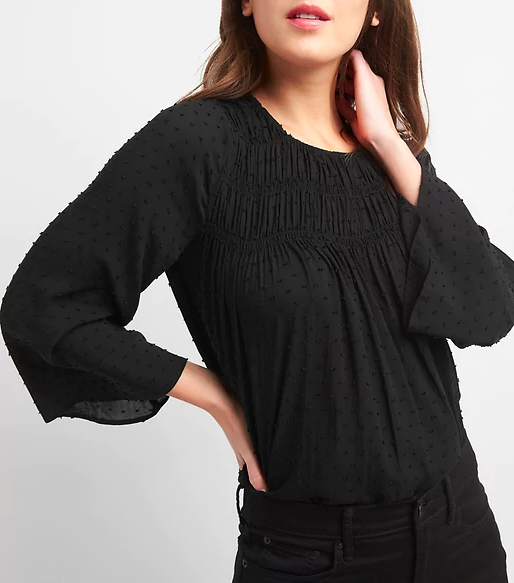 This sweet black Swiss dot blouse could totally be from Ulla Johnson. A western-style denim shirt should probably be added to my next list of must-have classics. 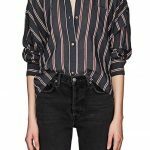 A pintucked popover with a barely-there striped print. I like how gauzy this top looks. Tried the patchwork dress when it first came out…absolute perfection if you are 6 feet tall and weigh 96 lbs. For the rest of us…noooooo. saw the knotted dress in both Gap and BR but haven’t tried it yet. Tried the patchwork dress when it first came out...absolute perfection if you are 6 feet tall and weigh 96 lbs. For the rest of us...noooooo. saw the knotted dress in both Gap and BR but haven't tried it yet. The knot makes it look like the dress got stuck in your underwear. The knotted dress just lays there. Rather droopy. Mine’s going back. The knotted dress just lays there. Rather droopy. Mine's going back. Weirdly attracted to that denim top! May have to try it on since I have to do some “mall shopping” for Muther’s 92nd b-day (she wants a wig, but I’m thinking pull on pants). Also, the denim shirt because of the western styling (and I need another denim shirt like I need another white shirt like I need another pair of sneakers like I need another white t-shirt like I need another mascara like I need another lip tint yada yada yada). Weirdly attracted to that denim top! May have to try it on since I have to do some "mall shopping" for Muther's 92nd b-day (she wants a wig, but I'm thinking pull on pants). 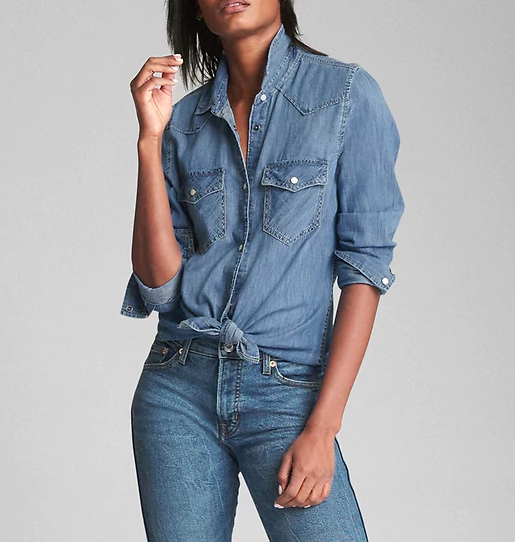 Also, the denim shirt because of the western styling (and I need another denim shirt like I need another white shirt like I need another pair of sneakers like I need another white t-shirt like I need another mascara like I need another lip tint yada yada yada). The denim tank is 100% winner. Looks like something that would be $250 from a boutique. I haven’t tried washing it yet so I don’t know about the quality, but fit and practicality and stylishness are high. The denim tank is 100% winner. Looks like something that would be $250 from a boutique. I haven't tried washing it yet so I don't know about the quality, but fit and practicality and stylishness are high. I bought that ruched t-shirt dress last year in grey and in black, I highly recommend it. It was flattering and very forgiving (great for my postpartum body). Looks like the grey color is on final sale in XL and XXL. I like this easy-to-wear dress so much, I think I will get it in blue. 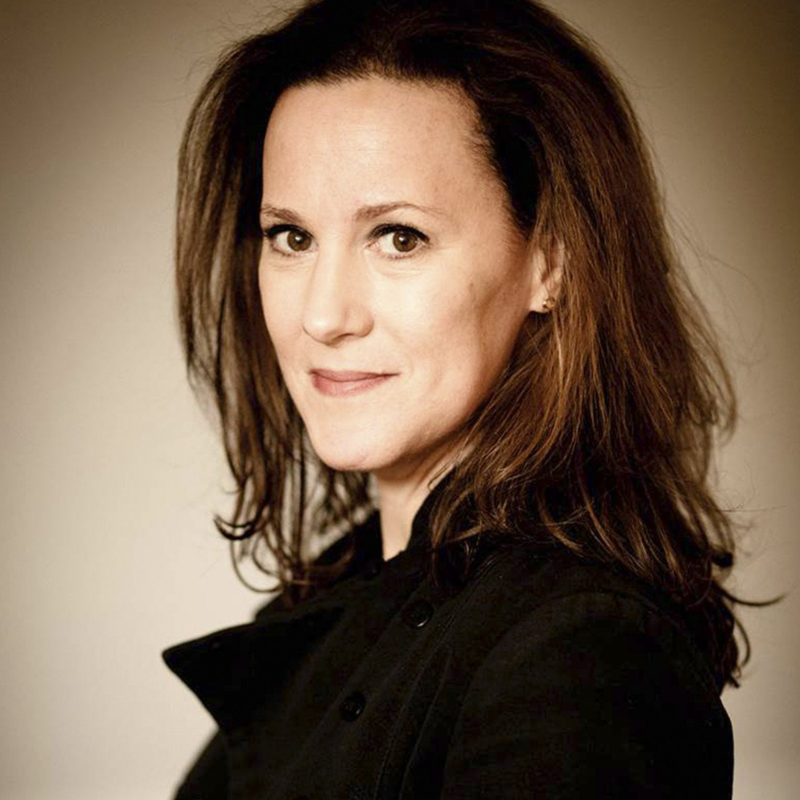 Hi Darcy, if the Gap did not change the armhole size from last year’s dress version, it should not show any side bra. I think this year’s dress in black on the model is too big or too long on her. The ruching is well below her stomach. If you see the model in the blue dress (a different woman altogether), that is how my tee dresses fit me and the armholes aren’t gaping so low as the black dress. I even ordered one size up from my normal top (bought a medium instead of a small), to hide my postpartum stomach area and had no side bra peeking. 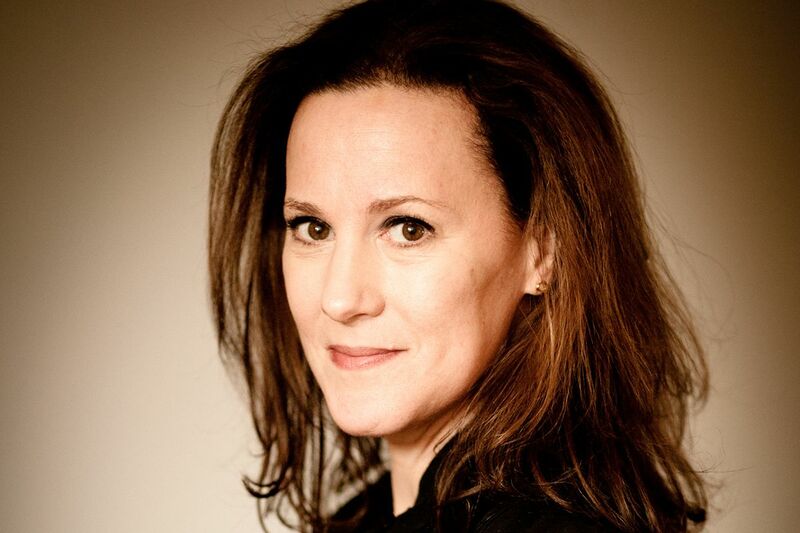 Hi Darcy, if the Gap did not change the armhole size from last year's dress version, it should not show any side bra. I think this year's dress in black on the model is too big or too long on her. The ruching is well below her stomach. If you see the model in the blue dress (a different woman altogether), that is how my tee dresses fit me and the armholes aren't gaping so low as the black dress. I even ordered one size up from my normal top (bought a medium instead of a small), to hide my postpartum stomach area and had no side bra peeking. If you want see pictures of me wearing the dress, front and side view, it’s on my Instagram (@valleyoftheshoes) on 8/24/17 and 10/28/17. If you want see pictures of me wearing the dress, front and side view, it's on my Instagram (@valleyoftheshoes) on 8/24/17 and 10/28/17. I have such feelings of ennui for Gap, but the weird dress speaks to me on a deep level. Love these selections. The chains offer a wide range of sizes — great for someone who is 5’4″. I ordered the t-shirt dress in an 8 petite. Love these selections. The chains offer a wide range of sizes -- great for someone who is 5'4". I ordered the t-shirt dress in an 8 petite. Or 5’10”, I can always find talls! Thanks for the tip on the patchwork dress, Lola — I was drawn to it! May go for that black dotted swiss top –40% off today! Thanks for the tip on the patchwork dress, Lola -- I was drawn to it! May go for that black dotted swiss top --40% off today! A couple of weeks back I bought two of the linen popovers, one in white and one in light blue. Love them! Missed the t-shirt dress and agree this one has a more interesting neckline as yesterday’s. The Gap near me closed quite a few years ago, but they have a good online presence and frequent sales. Can’t wait to see what goodies you have up your Swiss dot sleeve tomorrow, Kim. A couple of weeks back I bought two of the linen popovers, one in white and one in light blue. Love them! Missed the t-shirt dress and agree this one has a more interesting neckline as yesterday's. The Gap near me closed quite a few years ago, but they have a good online presence and frequent sales. Can't wait to see what goodies you have up your Swiss dot sleeve tomorrow, Kim. I am 5’8” and about 150lbs and am scoffing at the warnings about the patchwork dress. My grandma was an avid quilter and I NEED that dress. I vow I will find a way to make it work! Kim, I love these chain updates. Any chance you will dip into JCrew and Ann Taylor? The Gap’s jeans are underrated. The “Real Straight” in white are my official summer jeans and you can often snag excellent straight-leg mid-rise denim with no more than 2 percent spandex for less than $40! The Gap's jeans are underrated. The "Real Straight" in white are my official summer jeans and you can often snag excellent straight-leg mid-rise denim with no more than 2 percent spandex for less than $40! 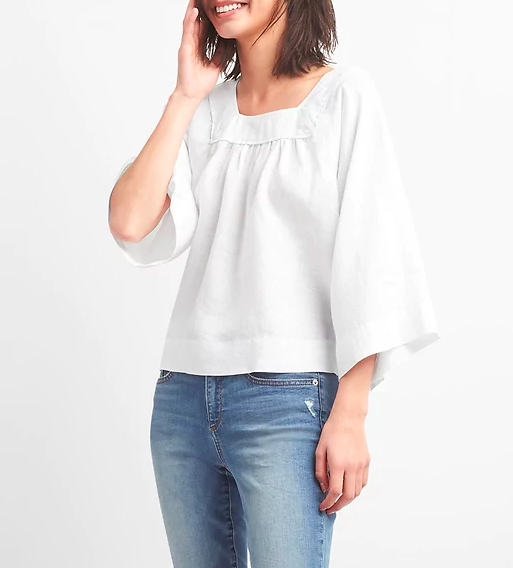 I got the 1st top, but in pale pink linen and I love it with the sleeves rolled and distressed jeans & Converse (now), sandals (later). I like that gauze top at the end, too. I can still find stuff I like! I still love Gap chinos. I have two pairs from them, a classic khaki and an army green. They’re just well-made, reasonably priced chinos. The fabric is good, not paper thin, and they fit me great. I still love Gap chinos. I have two pairs from them, a classic khaki and an army green. They're just well-made, reasonably priced chinos. The fabric is good, not paper thin, and they fit me great. I moved on from Gap a while ago, but I LIVED in their clothes in the 90s, and the smell of the store brings back some serious “Reality Bites” nostalgia. I moved on from Gap a while ago, but I LIVED in their clothes in the 90s, and the smell of the store brings back some serious "Reality Bites" nostalgia. I’m in the process of losing a lot of weight (50 lbs and counting) and I’ve placed several orders from the Gap in the last few months. 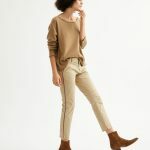 There’s almost always a deep discount and it’s been a good source for basics that I don’t mind donating after I wear a few months and then drop a size. Their ‘soft spun’ knits are heavenly! I'm in the process of losing a lot of weight (50 lbs and counting) and I've placed several orders from the Gap in the last few months. 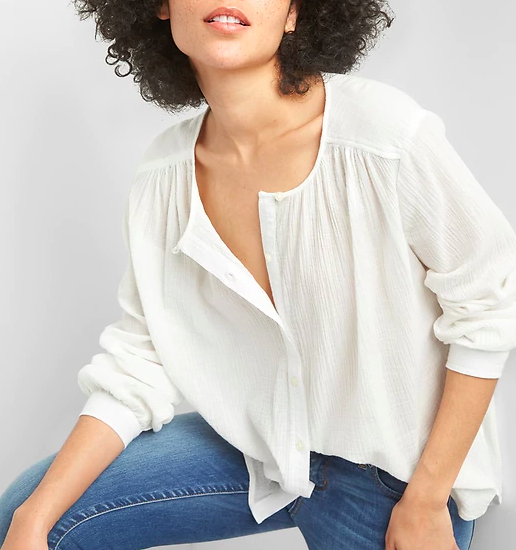 There's almost always a deep discount and it's been a good source for basics that I don't mind donating after I wear a few months and then drop a size. Their 'soft spun' knits are heavenly!